Who will not be curious if you see a house in the middle of the woods? I actually think that the house seemed to grow from the ground or that you need to dig in order to see its real appearance. 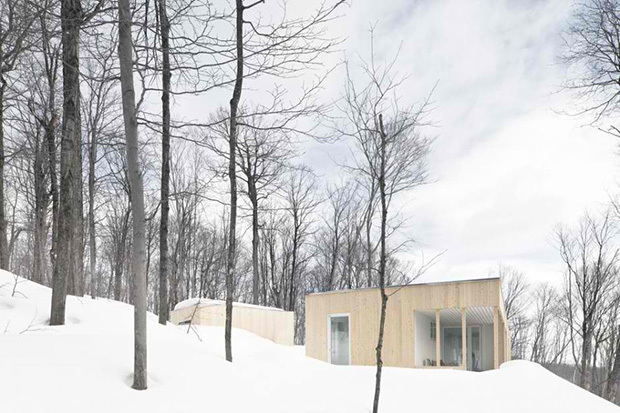 This Blue Hills House located in Morin-Heights, Quebec, Canada is camouflaged in its setting similar to a chameleon but it isn’t the house that changes yet the outdoor scenario. A chameleon may change its appearance to blend with the environment but this house doesn’t have to change its color. It is just like that but I think it does look a bit discreet and camouflaged from the trees because of its wooden exterior. Yet, no matter how hard they try, the beauty of the house really shows up. 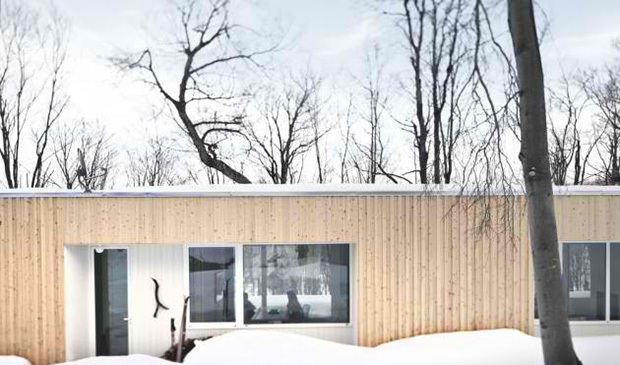 From a distance, it is may look like an ordinary cabin but when you set foot inside, you are up for a surprise. 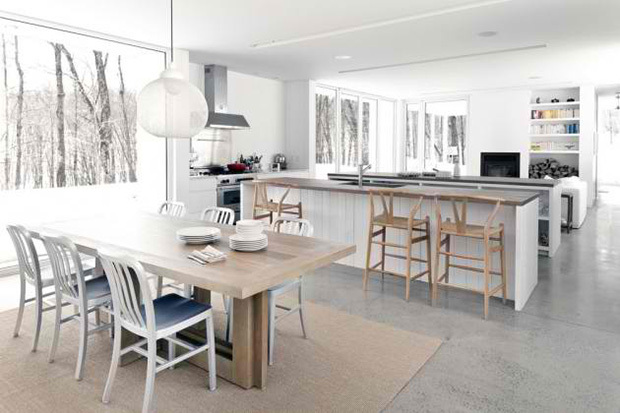 The house looks simple as it sit here with the trees and the snow that surrounds it. It is perched on a steep inclined area over the swamps. With the trees near the house, it can be hardly seen from the streets hiding it from the view of the passersby. 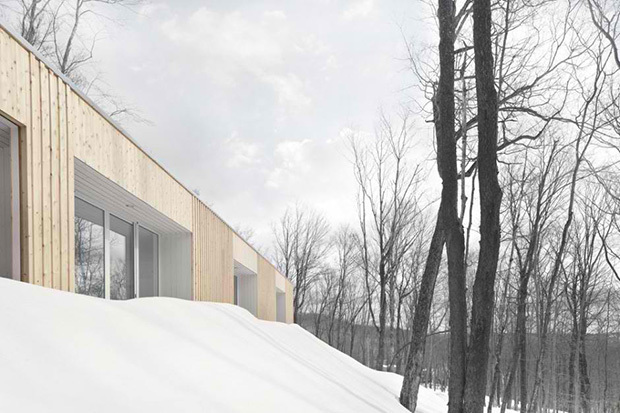 Imagine the trees with leaves minus the snow around it, the house will look slightly discreet but will still certainly stand out. Credit that appeal to its wooden exterior and glass windows. But like what we said, there is more to it in the interior. 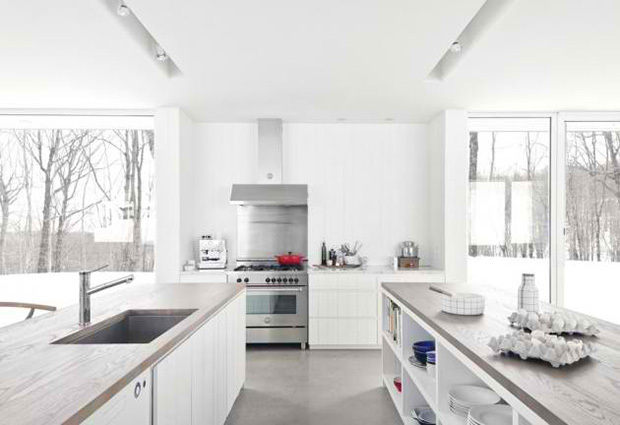 I can feel like the whiteness of the interior is from the snow outside but of course it isn’t for this will remain white no matter what the season is. 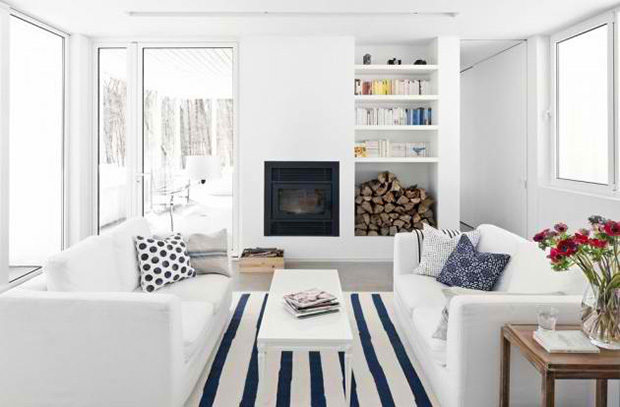 The pops of blue from the throw pillows and area rug is like extending the color of the sky to the home. From inside, the trees are still visible through the glass windows. 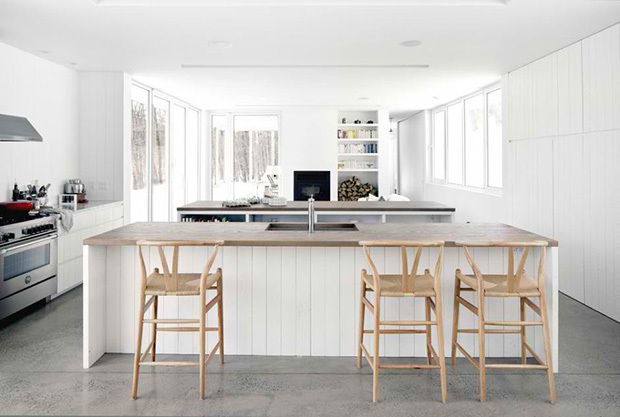 A kitchen island sits with pride in the open plan layout of the home’s interior. And it is paired with another counter that has cubby storage under it. 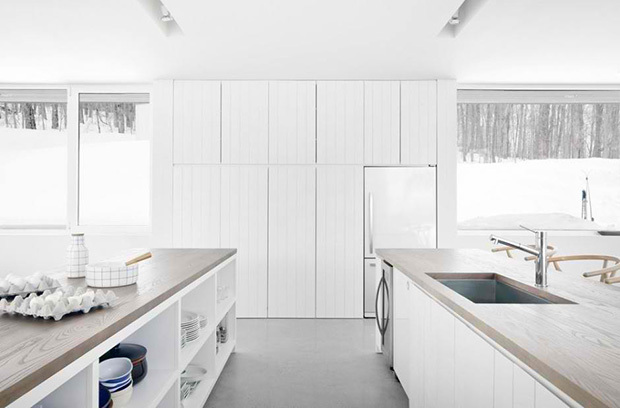 While a floor to ceiling white cabinet stands on the other end to keep kitchen stuff away from view. 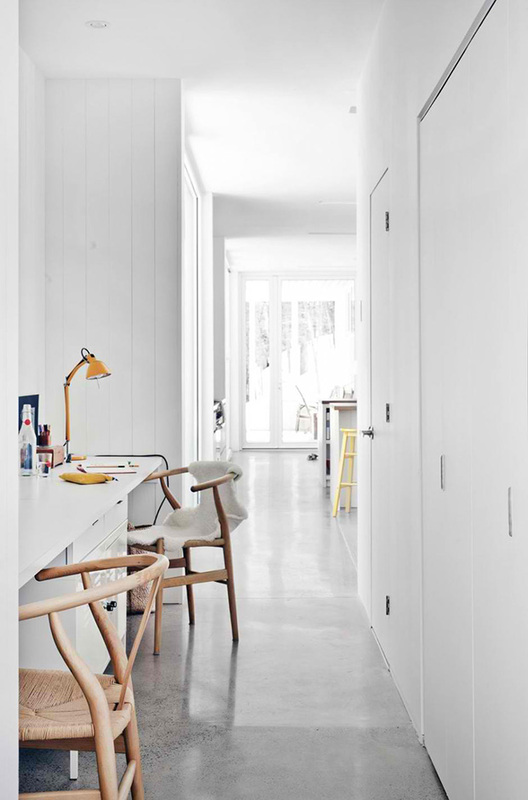 And who would expect to see a hallway this small but managed to integrate a working area? Despite the white interior, it makes one feel welcomed. 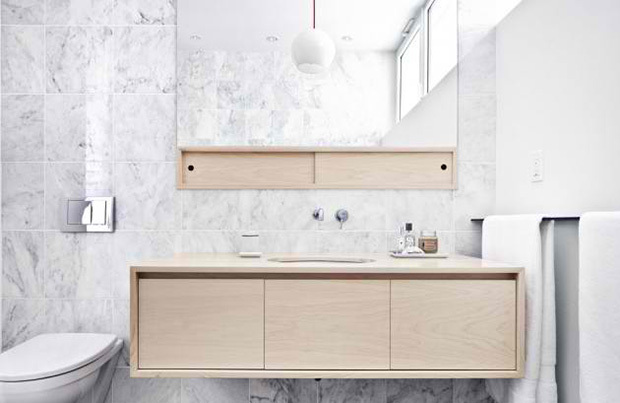 The bathroom may not be white but in subtle grayish tones yet it reflects the same feel as the other spaces in the house. I’d love to have a bathroom as sleek as this! And if you still wonder how the house was arranged in terms of spaces, this floor plan will answer all your queries. 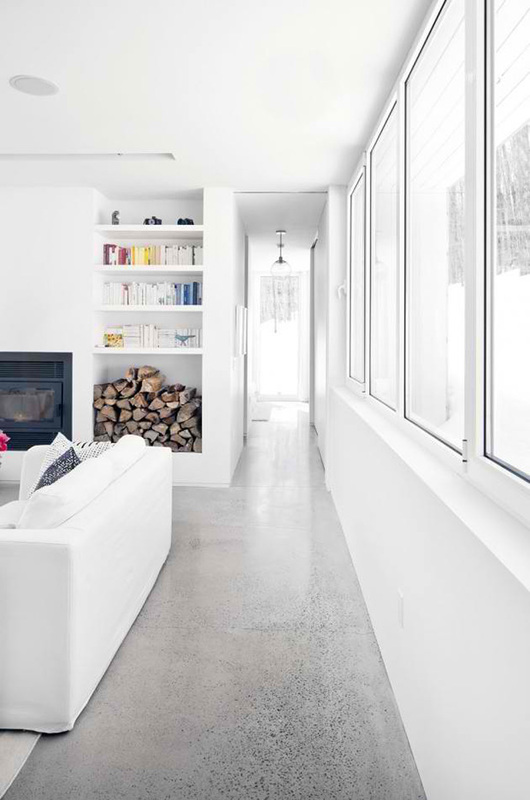 Discreet as it may seem but the house is actually open to the surroundings from the inside where a constantly changing scenario can be seen by the homeowners. The la SHED Architecture designed it to camouflage with nature like a chameleon but it is actually the environment that changes while the house remains still with grandeur beauty. 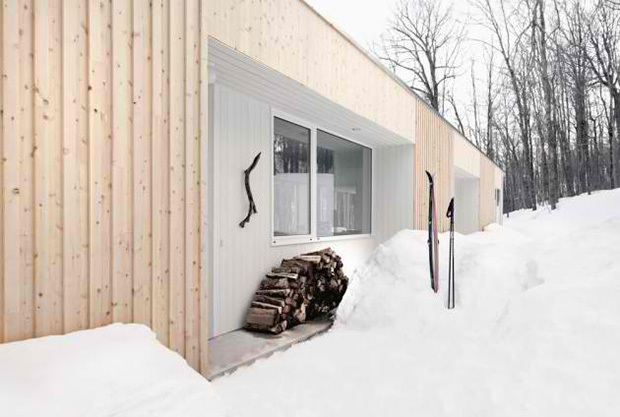 Well, this house indeed, is no ordinary cabin at all!